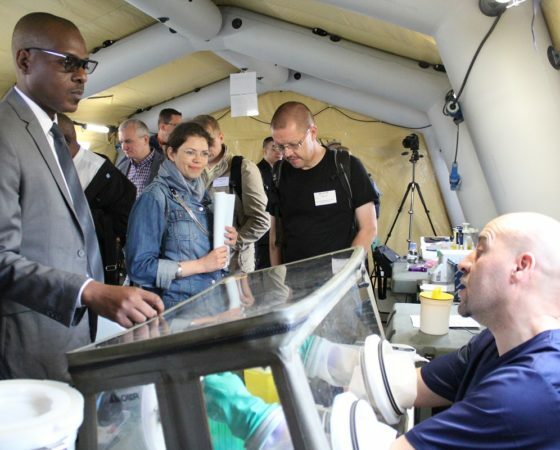 On the 19th and 20th of June the eNOTICE project set up an international CBRN exercise in Vilvoorde on the topic of preparation and response to a biological type event. Interactions and information sharing between police, civil protection and military collection teams were assessed. The deployment of mobile laboratory units has been completed and the importance of the communications service with the authorities put forward. It was an opportunity to share these first results with the representatives of the ENCIRCLE CLUSTER and to concretize the effective collaboration of these two H2020 programs aimed at bringing together all the European CBRN stakeholders, in particular the industrial communities, the end-users and training centers. Ouvry present as coordinator of the technological community ENCIRCLE fully supports the participation of industry in these exercises to support stakeholders, train operational trainers and analyze gaps or needs that require innovative actions.